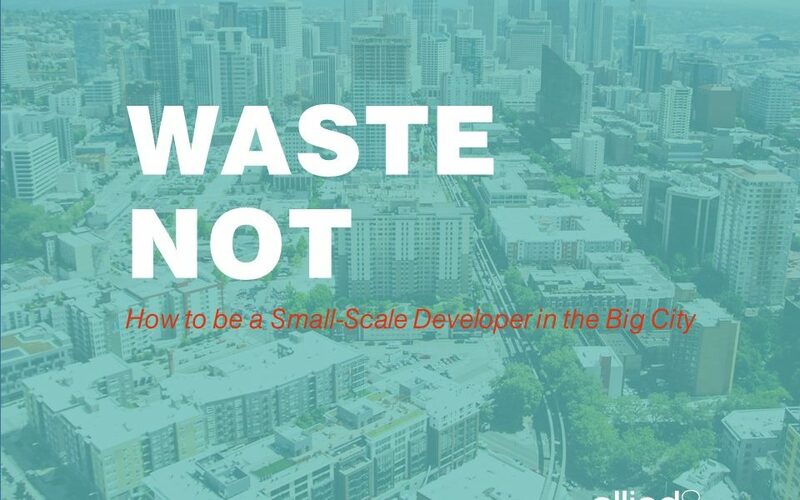 Leah Martin & Katie Cote of Allied8 presented a talk at the Northwest EcoBuilding Guild Conference 2015 entitled: Waste Not: How to be a small developer in the big city. A three-part blog series posted here is based on that presentation. Seattle is one of the fastest growing cities in the country. As we witness the transformation of our neighborhoods and our built-environment city-wide, we hear a lot of people feeling panicked or uneasy about such rapid change. So in our office we have been thinking: How can creative development strategies address both the need to add housing units, and the desire to promote a sense of place with a human scale? Historically a gritty frontier, then a logging and coal mining town, the Klondike Gold Rush launched Seattle, and the city has been attracting explorers, entrepreneurs and hard workers ever since. Seattle is home to an international timber industry, an airplane aviation dynasty, several coffee empires, countless musical legacies, and global leadership in biotech, computing, and online industries. In short, times have been good and as a desirable place to live & work, Seattle continues to be a boomtown. Waves of new residents and projections for pending population growth are inspiring construction at unprecedented rates. According to a report from Mayor Ed Murray’s task force on Housing Affordability and Livability the city needs to add 50,000 additional housing units over the next decade to meet its projected needs. This is a colossal challenge; and so it’s no wonder most development follows a similar path: a developer finds an underutilized parcel or block, tears down the too-small or too-old building, and builds a new building that maximizes the size and housing units allowed by zoning. We are seeing lots of big projects, with big capital, and big impact. Allied8 is exploring alternative development strategies where, by a more modest increment, we address both the addition of housing units, and the building of a neighborhood. In Part 2, we discuss how older and smaller buildings offer opportunities to the nimble small-scale developer. The remodel or adaptive reuse of an existing building and/or the expansion of an existing building are strategies that take advantage of available built resources, scales of profitability, alternative models of sustainability, as well as promote some continuity to our built environment through time that is ultimately vital to our city’s identity and sense of place.